I am running for the Fairfax County Public Schools (FCPS) school board to end mediocrity and inequity in our schools and free teachers from administrivia. Here are my thoughts on the approaches I would adopt when trying to fix these serious issues. I will really appreciate if you would connect with me with your thoughts and suggestions on how we can improve our public schools. Compensating the teachers above the other local jurisdictions is important but that alone won’t help. System’s refusal to pay differentially contributes to middle school gym teacher having same pay as high school physics teacher. We need to better-compensate the best we have than hire more, enforce performance standards for pay increases, stop overemphasizing reading/math test scores at the expense of real instruction, stop using teachers as tools for social engineering and allow them to be expert instructors in their chosen disciplines. I oppose burdening teachers with excessive testing and reporting, mandatory continuing education, and fads imposed by administrators trying to justify their existence. Teachers are the architects for our future, and only competent and trustworthy should be hired for such important roles. Once hired, they should be trusted and empowered to take on the most challenging task of educating and to enforce discipline in their classrooms. Citizens having sound knowledge of the history of the country and having right perspectives based on that knowledge plays a critical role in shaping the destiny of a nation. Some of it happens with the passing of traditions and sharing of stories of involvement of ancestors in influencing the nation’s history. However, most of it happens in the classrooms of the country. Such learning from classrooms becomes extremely important as more and more of the population of a jurisdiction becomes international and immigrant in nature, just as it is happening in Fairfax county. This is a huge challenge that FCPS need to address now. Having two children graduated from the FCPS system with outstanding honors, still having poorer knowledge of ‘American History’ than their immigrant parents, I have personally witnessed the lack of depth and continuity of ‘US History’ in FCPS curriculum. This deficit is something that I am very concerned about. As a school board member and a proud US citizen I will play a key role to change this scenario for the better. Incremental US history education from K to 12 should be mandated as a requirement for graduation. Advanced Academic Programs (AAP) / Gifted & Talented (GT) programs exist for a reason. They support gifted children’s needs by supporting high quality gifted and advanced education in FCPS. Politicians and vested interest trying to dilute such programs by branding those as not equitable and diverse enough is fundamentally wrong. Such approach will erode the much-acclaimed merit reputation of the FCPS system. As a school member, I will ensure that the FCPS mission to have challenging programs for its gifted students, without any regard to their race, gender or income, remains in place and their current funding levels are preserved. Thomas Jefferson High School for Science and Technology (TJ) is the only magnet school in Fairfax County for its gifted children. TJ provide challenging learning environment focused on math, science, and technology. However, gifted children with interests in various other disciplines as well exist. TJ being the only such school available now, children gifted in arts and humanities too are tempted to get into TJ. Later, they pursue disciplines other than math, science or technology. This undermines the mission of TJ and this needs to be addressed. I propose to establish an additional magnet school in Fairfax County with a focus in arts, humanities, government and international studies, as a public-private partnership. The funding model should be designed with the least burden on Fairfax county tax payer, as a partnership between Fairfax County, private enterprise as well as other public education systems in the area. This should be an innovative institution offering a comprehensive college preparatory program emphasizing government, international studies, science, mathematics, languages, and fine arts. As a jurisdiction just outside of Washington DC, I believe that Fairfax County is the ideal place to have such a magnet school and we have to provide leadership to the area jurisdictions to make it happen. The nature of the proposed school makes it a good candidate to gain significant support from the federal government in its founding efforts. There is no equity for students from disadvantaged groups in the county who consistently score lower on tests. 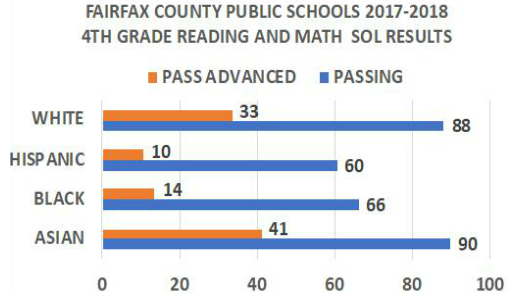 This gap begins in 4th grade because of the flawed FCPS reading and arithmetic curricula. 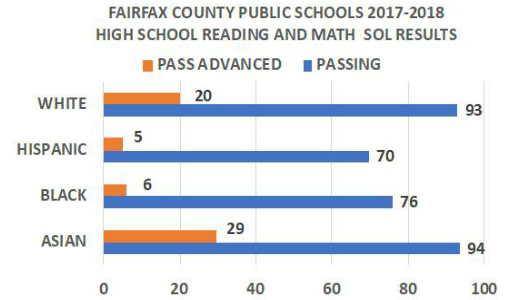 I believe the way to deal with the apparently insurmountable ‘Minority Student Achievement Gap’ in Fairfax county is adjusting methods of learning, and not conducting social experiments. Despite all the efforts and money spent by our system for decades, schools with predominantly low-income minority households continue to underperform in fulfilling their mission. It is time to think out of the box. Direct instruction methods in contrast to exploratory models such as inquiry-based learning currently employed at FCPS is found to be much more effective, and should be explored. Curricula such as Montessori or Direct Instruction System for Teaching Arithmetic and Reading (DISTAR) with phonics-based reading instruction and adequate drill will benefit all students. Education choices afforded by School Voucher programs in 15 states and Washington, D.C have proven to make situation better. School vouchers give parents the freedom to choose a private school for their children, using all or part of the public funding set aside for their children’s education. Possibilities such as school choice and charter schools should be explored as potential solutions to this issue. The ACT college admissions test results show that only 55% of the FCPS seniors tested were prepared for college-level STEM (Science, Technology, Engineering, Math) courses. Only 21% passed Algebra I in the SOL End-of-Course test. That’s the average and numbers don’t lie. Lower achieving regions of the county have much worse numbers. Continuing the assertion that Fairfax School system is excellent is beyond any rational thought. STEM related jobs are the jobs of the new economy and the number of STEM jobs going unfilled are exploding due to lack of qualified STEM graduates. We are increasingly dependent on foreign talent to fulfill this void. Outsourcing of American jobs to Asian countries is hurting the American economy in the longer term. Asian American parents as well as children have done exceedingly well in the STEM fields while going to the same schools with everyone else. We have to learn from the success of Asian communities in STEM and make appropriate adjustments to our STEM curriculum and teaching methods. From my personal experience with a bachelor’s degree from India and a master’s degree from US, both in engineering, having a wife with a bachelor’s and master’s degrees in mathematics and statistics from India, and having two children with good track records in STEM subjects at FCPS and computer science engineering degree from University of Virginia School of Engineering, I clearly understand how the Asian American community makes the STEM success possible. There is no magic to it. A good percentage of these children get supplemental coaching from private tutoring centers. Most of these centers employ direct instruction methods similar to Direct Instruction System for Teaching Arithmetic and Reading (DISTAR) in contrast to exploratory models such as inquiry-based learning that we employ at FCPS. Asian Americans being the largest minority group in Fairfax county with about 20% of the population, presents us with a great opportunity. Exploring potential synergies between much acclaimed and proven STEM teaching methods in Asian communities and effecting possible adjustments to the teaching methods in FCPS to scale it for the entire FCPS system is worth considering. I am willing to dedicate my time to develop such approaches, curriculum and methods and I am confident that I can help bridge the STEM deficit conundrum. If such efforts can achieve the desired results in Fairfax county, FCPS can become a role model for the entire nation to deal with this nationwide issue.